Home Sweet Home: The New American Localism In an age of increased globalization, more Americans are doing more things closer to home. The new version of the popular bumper sticker "Support Your Local Sheriff" could become "Support Your Local Everything." Americans are craving food grown locally: There are now more than 6,000 farmers markets across the country. 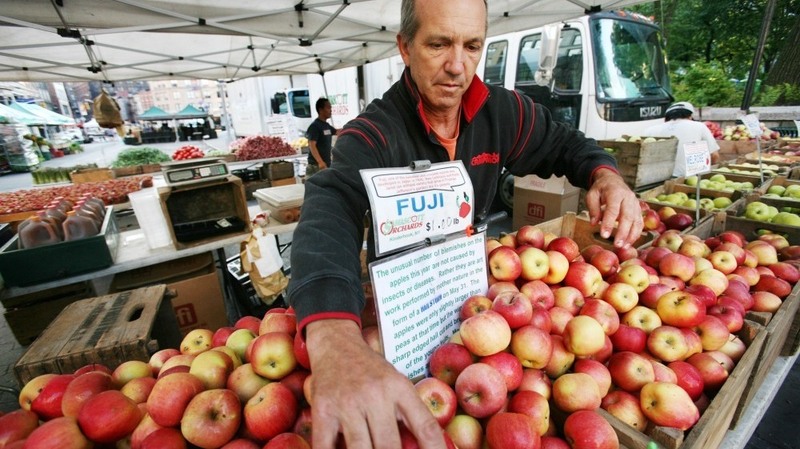 Here Ron Samascott organizes apples from his orchard in Kinderhook, N.Y., at the Union Square Greenmarket in New York. You can talk about the global village, a mobile society and the World Wide Web all you want, but many in our country seem to be turning toward a New American Localism. These days, we are local folks and our focus is local. We are doing everything locally: food, finance, news, charity. And maybe for good reasons. "One bedrock thing that is going on," says Brad Edmondson, founder of ePodunk and former editor of American Demographics magazine, is that "because of aging and the recession, people aren't moving around as much." The U.S. Census Bureau backs him up with a news release — based on a recent report — titled "Mover Rate Reaches Record Low." The bureau found that only 11.6 percent of Americans changed their living spaces between 2010 and 2011. That is the lowest rate on record since the Current Population Survey of the United States began tracking geographical mobility in 1948. In 1985, for instance, the changed-residence rate was 20.2 percent. "With homeowner mobility at an all-time low, more people are putting down roots and getting to know their neighbors," Edmondson says. "At the same time a lot of households have seen sharp declines in discretionary income. They are looking for ways to relax that don't cost as much, and they are substituting cooperation for cash." The new version of the popular bumper sticker "Support Your Local Sheriff" could become "Support Your Local Everything." With homeowner mobility at an all-time low, more people are putting down roots and getting to know their neighbors. Food. Grocery bins are burgeoning with local food. And local farmers markets are springing up like — and with — spring onions. Emily Walsh of Slow Food USA, a nonprofit that attempts to twin epicurean pursuits with social awareness, says consumer demand for locally grown food has, well, mushroomed. Walsh says "there are now more than 6,000 farmers markets nationwide — about a 250 percent increase since 1994." Finance. "There's a growing public backlash against the big banks by mainstream American consumers, and many people are shifting their business to smaller community banks and credit unions," says D. Anthony Plath, a professor of finance at the University of North Carolina, Charlotte. He says that anecdotal evidence provided by community banks and credit unions suggests that "consumers are moving deposits to these institutions in record numbers" especially since the Occupy protests and the federal bailout of — and threats of new fees from — colossal financial corporations. "We'll have to wait until next summer to see the extent — in terms of magnitude and duration — of the change in consumer behavior," Plath says. That's when the Federal Deposit Insurance Corp. releases its annual tracking data. But, he adds, "it looks like consumers really are voting with their feet and abandoning the convenience of larger banks for the humanity and trust of smaller institutions." Aleis Stokes of the Independent Community Bankers of America says that her organization's website "has seen a huge spike in hits over the past few months. More specifically, we've seen an over 800 percent increase in unique visitors to the site over the past two months." By banking locally, Stokes says, "consumers can make a real difference in the lives of their neighbors and the future of their community." News. Julie Moos of the Poynter Institute observed in September that "buried in the latest Pew research on where Americans turn for local news, there's this important trend: 72 percent of respondents — nearly three-quarters — say they follow local news closely most of the time, whether or not something important is happening. That's up from 57 percent in 2008." According to a MediaPost report in June, AOL's push for hyperlocal news, Patch.com, can now be found in more than 800 markets and "has seen 194 percent growth in the past six months." Charity. The Chronicle of Philanthropy reports a surge in regional and local giving days around the country. From the Chronicle: "The goal for last December's Colorado Gives Day was $1 million, say organizers. By day's end, $8.7 million had rolled in for 530 charities, according to Marla J. Williams, chief executive of Community First Foundation in Arvada, Colo., which created the event." The same Internet that expands our global reach also helps us live more locally. Coupon come-ons from sites such as Groupon and Living Social entice us to shop where we live. Other popular spots such as Foursquare and Neighborhoodr implore us to explore our immediate surroundings. "Local Is the New Global" was a seminar at the New York Internet Week convention in June. Web designers and app developers are mining this mother lode of localness. In many cities you can find sites and download apps that display local weather, dating opportunities, traffic flow, parking possibilities, churches, psychiatrists and creators of even more local websites and apps. In Vermont, folks find bike paths and walkable communities via Localmotion. In Sacramento, Calif., local people learn of goings-on through the communal site Sacwiki.org. And in Boston, the Citizens Connect app lets you report potholes that need fixing and graffiti that need erasing. It was, after all, a Bostonian, Thomas P. "Tip" O'Neill, who famously uttered that "All politics is local," meaning you care most about the politicians in, and the political well-being of, the places where you live and work. The recent Occupy movement was not so much a national uprising as an amalgamation of local, vocal outrages. It was not a whole-cloth blanket but a patchwork quilt. So what are the roots, the origins of this New American Localism? Perhaps you can trace it to earlier demonstrations, such as the 1999 anti-globalization protests against the World Trade Organization in Seattle. Or maybe you can look further back to small-town values migrating into larger urban centers. Or you can argue that Americans have always been more community-minded and, in many ways, more neighborly than nationally or internationally inclined. Regardless, the resurgent instinct just might provide another new slogan for a bumper sticker: "Think Locally, Act Locally."